Acute disseminated encephalomyelitis (ADEM) is an acute demyelinating disorder of the central nervous system, and is characterised by multifocal white matter involvement. Diffuse neurological signs along with multifocal lesions in brain and spinal cord characterise the disease. Possibly, a T cell mediated autoimmune response to myelin basic protein, triggered by an infection or vaccination, underlies its pathogenesis. ADEM is a monophasic illness with favourable long term prognosis. The differentiation of ADEM from a first attack of multiple sclerosis has prognostic and therapeutic implications; this distinction is often difficult. Most patients with ADEM improve with methylprednisolone. If that fails immunoglobulins, plasmapheresis, or cytotoxic drugs can be given. Recent literature suggests that a significant proportion of patients with ADEM will later develop multiple sclerosis; however, follow up experience from developing countries does not support this view. Acute disseminated encephalomyelitis (ADEM) is an acute widespread demyelinating condition, which principally affects brain and spinal cord (box 1). It usually follows an infection or vaccination. The disease is characterised by multifocal white matter lesions on neuroimaging. ADEM is a monophasic disease. Uncommonly ADEM can relapse frequently. If these relapses are thought to represent part of the same acute monophasic illness, the term multiphasic ADEM is used. Any recurrences beyond the first few months of initial clinical illness suggest the presence of a chronic immune process and a diagnosis of multiple sclerosis should be considered. Devic’s disease or neuromyelitis optica is characterised by simultaneous attacks of optic neuritis and myelitis with no evidence of involvement of other parts of the central nervous system. Precisely what relationship these distinct entities have with each other is a subject of intense controversy. In the recent past a lot of new information about ADEM and its association with other demyelinating disorders has been made available. In this article all this information will be reviewed. The exact incidence of ADEM is not known. In the past ADEM commonly followed common childhood infections (like measles, smallpox, and chickenpox) and was associated with significant mortality and morbidity. Because of significant advances in infectious disease control ADEM in developed countries is now seen most frequently after non-specific upper respiratory tract infections and the aetiological agent remains unknown. In a recent study by Murthy et al, despite vigorous attempts to identify microbial pathogens in 18 patients, only one patient had Epstein-Barr virus isolated as the definite microbial cause of ADEM. Of the other two patients with rotavirus disease, in one patient infection was considered as possibly associated with ADEM. Failure to identify a viral agent suggests that the inciting agents are unusual or cannot be recovered by standard laboratory procedures.1 In developing and poor countries, because of poor implementation of immunisation programmes, measles and other viral infections are still widely prevalent and account for frequent occurrences of postinfectious demyelinating diseases. ADEM in developing countries is much more frequent than reported.2 In the past it had been observed that ADEM occurred in one out of 1000 measles infections. ADEM was relatively uncommon after varicella infection and the incidence that had been reported was about one per 10 000 patients. The incidence of ADEM after rubella infection was approximately one per 500 infections. Mortality and major neurological sequelae of ADEM after varicella and rubella infections were much lower in comparison with ADEM after measles infection. ADEM found after measles was associated with mortality rates as high as 25% and 25%–40% of survivors were left with permanent neurological sequelae.3–5 The main bacterial infection, which has been implicated with the occurrence of ADEM, is mycoplasma. Other viral and bacterial infections that have been implicated with ADEM are listed in box 2. Recovery can begin within days; on occasion complete resolution is noted within a few days, but more frequently occurs over the course of weeks or months. The mortality varies between 10% and 30%, with complete recovery in 50%. Poor prognosis is correlated with severity and abruptness of onset of the clinical syndrome. In the case series after rabies vaccine, a mortality of 18% was recorded. After a mean follow up of 17 months, 68% of the survivors had completely recovered, and 32% had partially recovered, most with minimal deficits. In three patients in this series, a relapse of neurological deficit occurred during the recovery period. None of the patients experienced relapse once complete recovery had occurred.6 Measles virus associated ADEM may carry a worse prognosis than vaccine associated disease. However, with introduction of effective vaccination strategies and decline of measles, death is rare. T2-weighted MRI showing multiple hyperintense lesions in the centrum semiovale of right cerebral hemisphere. MRI of patient a week before a febrile illness. T1 (A) and T2 (B) images showing extensive bilateral demyelination of white matter of frontal lobes. This 20 year woman presented with bilateral vision loss, cerebellar manifestations, and with extensive pyramidal signs. 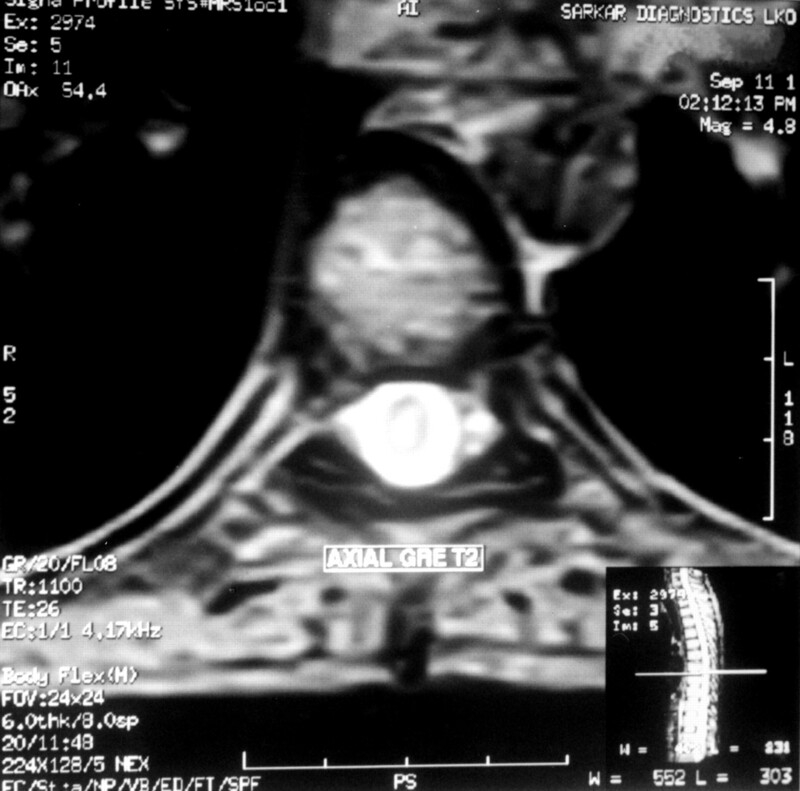 Axial T2-weighted MR image of thoracic spinal cord showing a centrally located hyper intense signal in a patient with ADEM having transverse myelopathy. A combination of fever, seizures, altered sensorium, early parenchymal imaging abnormalities, and cerebrospinal fluid pleocytosis can cause confusion with viral encephalitis. A clear cut latent period between systemic symptoms and neurological illness favours ADEM, because of the typical pattern of diffuse and multifocal involvement of both the central nervous system and peripheral nervous system and the usual MRI appearance.42 Epidemic occurrence of central nervous system symptoms, absence of focal signs, and persisting systemic involvement are more likely in viral encephalitis. In an endemic region patients with ADEM may also need to be differentiated from a postmalarial neurological syndrome.47,48 This syndrome has been defined as the acute onset of neurological or neuropsychiatric symptoms in patients recently recovered from Plasmodium falciparum malaria who have negative blood films at the time of onset of symptoms. There are certain similarities between ADEM and postmalarial neurological syndrome. These are latency from infection to neurological dysfunction, multifocal neurological deficits, response to steroids, good prognosis, and identical white matter MRI abnormalities. Mohsen et al believe that ADEM and postmalarial neurological syndrome are indistinguishable,48 so P falciparum should be added to the list of infections that are able to precipitate ADEM. In one of the recently published series of ADEM in 31 children, 81% of patients recovered completely with various immunomodulator agents.34 In the remaining five patients only mild neurological sequelae were recorded. None of the patients died during follow up. In this series, four patients had relapses, and three of these had involvement of the corpus callosum on MRI (the authors considered this a feature suggestive of multiple sclerosis), even then the authors did not think that any of these patients had multiple sclerosis. In another paediatric series by Belopitova et al, 25 children aged of 3–18 years with an initial diagnosis of ADEM were followed up for a period of 2–8 years.56 In 10 children there were data for clinically definite or laboratory supported definite multiple sclerosis. The remaining 15 children in this study were suspected to have multiple sclerosis. These authors think that the dynamic long term follow up (with the help of neuroimaging, cerebrospinal fluid, and evoked potential studies) of pathological changes is of prognostic significance for the course of the disease, which could be a definite cessation of the process in ADEM cases or transition to multiple sclerosis. ADEM—A DISTINCT DISEASE OR PART OF THE MULTIPLE SCLEROSIS SPECTRUM? One of the most intriguing features of ADEM is its exact relation with multiple sclerosis. Because of many similarities in clinical features, MRI findings, and pathogenesis several authors believe that ADEM is part of the multiple sclerosis spectrum.42 The precipitants of demyelination in both conditions may be an infectious (especially viral) illness and share the major pathogenetic characteristic of an obligatory alteration of blood-brain barrier. However, the mechanisms of myelin destruction may be different. It is well known that multiple sclerosis is more prevalent in certain races because of genetic predisposition, while ADEM is seen in all races and geographical areas. In India and other developing countries ADEM is a common disease, but multiple sclerosis is infrequently seen. Here a large number of cases of ADEM occur after specific viral infections (for example, measles) or after the use of outdated vaccines and because the incidence of various specific infections that may predispose to ADEM is still high and Semple antirabies vaccine is still in use.57 ADEM caused by Semple antirabies vaccine is often associated with involvement of the peripheral nervous system in the form of radiculoneuropathy.30 In contrast to reports from Western countries, conversion of ADEM to multiple sclerosis has not been reported from developing countries. Modi et al recently described eight black South African patients (a population with a low risk of multiple sclerosis) with a new multiphasic steroid-responsive demyelinating disorder of the central nervous system. Neuroimaging in these patients showed features consistent with those described for ADEM as well as some features that were described in multiple sclerosis. These patients had two or more distinct acute attacks of a demyelinating disorder separated in space and time generally with poor outcome and stepwise disabilities after repeated attacks. Authors were not sure about the exact diagnosis in any of the cases.58 Therefore, it can be argued that ADEM seen in developing countries is a distinct syndrome and is not part of the multiple sclerosis spectrum. ADEM is a monophasic inflammatory disease affecting the central nervous system, which usually follows an infection or vaccination. It is difficult to differentiate ADEM from a single episode of multiple sclerosis because of the largely similar clinical presentation, cerebrospinal fluid analysis, histopathological and neuroimaging appearance. Recent literature indicates that a significant proportion of adult and paediatric patients with ADEM develop clinically definite multiple sclerosis in due course. However, it is not possible to identify with certainty any clinical marker, which can differentiate ADEM from the initial presentation of multiple sclerosis. Experts now believe that ADEM and multiple sclerosis are parts of the same spectrum of inflammatory demyelinating conditions. In India and other developing countries ADEM is a common neurological condition, possibly because of the high prevalence of causative infections. However, the reasons for the low occurrence of multiple sclerosis are not known. Murthy SNK, Faden HS, Cohen ME, et al. Acute disseminated encephalomyelitis in children. Pediatrics2002;110(2) (http://www.pediatrics.org/cgi/content/full/110/2/e21). Murthy JM, Yangala R, Meena AK, et al. 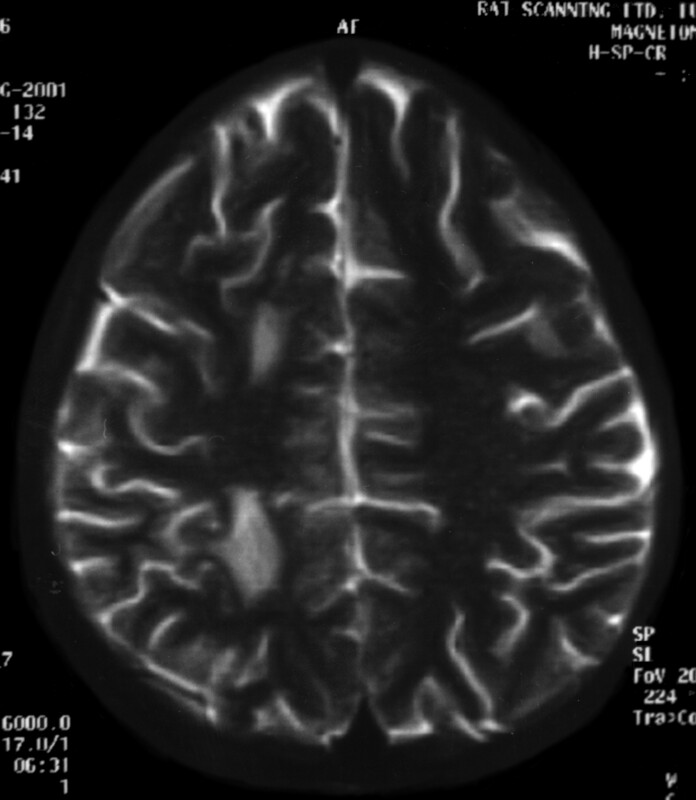 Acute disseminated encephalomyelitis: clinical and MRI study from South India. J Neurol Sci1999;165:133–8. Litvak AM, Sands IJ, Gibel H. Encephalitis complicating measles: report of 56 cases with follow-up studies in 32. Am J Dis Child1943;65:265–95. Miller HG, Evans MJ. Prognosis in acute disseminated encephalomyelitis: with a note of neuromyelitis optica. Q J Med1953;22:247–79. Stuve O, Zamvil SS. Pathogenesis, diagnosis and treatment of acute disseminated encephalomyelitis. Curr Opin Neurology1999;12:395–401. Held JR, Adros HL. Neurological disease in man following administration of suckling mouse brain antirabies vaccine. Bull World Health Organ1972;46:321–7. Label LS, Batts DH. Transverse myelitis caused by duck embryo rabies vaccine. Arch Neurol1982; 39:426–30. Swamy HS, Shankar SK, Satish Chandra P, et al. Neurological complications due to beta-propiolactone (BPL) inactivated antirabies vaccination. J Neurol Sci1984;63:111–28. Hemchudha T, Griffin DE, Giffels JJ, et al. Myelin basic protein as an encephalitogen in encephalomyelitis and polyneuritis following rabies vaccination. N Engl J Med1987;316:369–74. Murthy JMK. MRI in acute disseminated encephalomyelitis following Semple antirabies vaccine. Neuroradiology1998;40:420–3. Chakrawarty A. Neurologic illness following post-exposure prophylaxis with purified chick embryo cell antirabies vaccine. J Assoc Physicians India2001;44:927–8. Fenichel GM. Neurological complications of immunization. Ann Neurol1982;12:119–28. Nalin DR. Mumps, measles and rubella vaccination and encephalitis (letter). BMJ1989;299:1219.
van Bogaert L. Post-infectious encephalomyelitis and multiple sclerosis: the significance of perivenous encephalomyelitis. J Neuropathol Exp Neurol1950;9:219–49. Allen IV. Demyelinating diseases. Greenfield’s neuropathology. 4th Ed. In: Adams JH, Corsellis JAN, Duchen LW, eds. London: Edward Arnold, 1984: 338–84. Davies JM. Molecular mimicry: can epitope mimicry induce autoimmune disease? Immunol Cell Biol1997;75:113–26. Johnson RT. Pathogenesis of acute viral encephalitis and postinfectious encephalomyelitis. J Infect Dis1987;155:359–64. Zamvil SS, Steinman L. The T lymphocyte in experimental allergic encephalomyelitis. Annu Rev Immunol1990;8:579–621. Gold R, Hartung HP, Toyka KV. Animal models for autoimmune demyelinating disorder of the nervous system. Mol Med Today2000;62:88–91. Laouini D, Kennou MF, Khoufi S, et al. Antibodies to human myelin proteins and gangliosides in patients with acute neuroparalytic accident induced by brain-derived rabies vaccine. J Neuroimmunol1998;91:63–72. ’t Hart BA, Brok HP, Amor S, et al. The major histocompatibility complex influences the ethiopathogenesis of MS-like disease in primates at multiple levels. Hum Immunol2001;62:1371–81. Scully RE, Mark EJ, McNeely WF, et al. Case records of the Massachusetts General Hospital, case 37–1995. N Engl J Med1995;333:1485–92. Scully RE, Mark EJ, McNeely WF, et al. Case records of the Massachusetts General Hospital, case 1–1999. N Engl J Med1999;340:127–35. Stefansson K, Hedley-Whyte ET. Case records of the Massachusetts General Hospital, case 8−1996—a 28 years old woman with rapid development of a major personality change and global aphasia. N Engl J Med1996;334:715–21. Liu J, Marino MW, Wong G, et al. TNF is a potent anti-inflammatory cytokine in autoimmune-mediated demyelination. Nat Med1998;4:78–83. Sabelko-Downes KA, Russell JH, Cross AH. Role of Fas–FasL interactions in the pathogenesis and regulation of autoimmune demyelinating disease. J Neuroimmunol1999;100:42–52. Boullerne AI, Nedelkoska L, Benjamins JA. Role of calcium in nitric oxide-induced cytotoxicity: EGTA protects mouse oligodendrocytes. J Neurosci Res2001;63:124–35. van der Goes A, Brouwer J, Hoekstra K, et al. Reactive oxygen species are required for the phagocytosis of myelin by macrophages. J Neuroimmunol1998;92:67–75. Matute C, Alberdi E, Domercq M, et al. The link between excitotoxic oligodendroglial death and demyelinating diseases. Trends Neurosci2001;24:224–30. Murthy JMK, Yangala R, Meena AK, et al. Clinical, electrophysiological and magnetic resonance imaging study of acute disseminated encephalomyelitis. J Assoc Physicians India1999;47:280–3. Schwarz S, Mohr A, Knauth M, et al. Acute disseminated encephalomyelitis: a follow-up study of 40 adult patients. Neurology2001;56:1313–18. Apak RA, Kose G, Anlar B, et al. Acute disseminated encephalomyelitis in childhood: report of 10 cases. J Child Neurol1999;14:198–201. Dale RC, de Sousa C, Chong WK, et al. Acute disseminated encephalomyelitis, multiphasic disseminated encephalomyelitis and multiple sclerosis in children. Brain2000;123:2407–22. Hynson JL, Kornberg AJ, Coleman LT, et al. Clinical and neuroradiologic features of acute disseminated encephalomyelitis in children. Neurology2001;56:1308–12. Hollinger P, Sturzenegger M, Mathis J, et al. Acute disseminated encephalomyelitis in adults: a reappraisal of clinical CSF, EEG and MRI findings. J Neurol2002;249:320–9. Lukes SA, Norman D. Computed tomography in acute disseminated encephalomyelitis. Ann Neurol1983;13:567–72. Caldmeyer KS, Smith RR, Harris TM, et al. MRI in acute disseminated encephalomyelitis. Neuroradiology1994;36:216–20. Singh S, Alexander M, Korah IP. Acute disseminated encephalomyelitis: MR imaging features. AJR Am J Roentgenol1999;173:1101–7. O’Riordan JI, Gomez-Anson B, Moseley IF, et al. Long term MRI follow-up of patients with post-infectious encephalomyelitis: evidence for a monophasic disease. J Neurol Sci1999;167:132–6. Bizzi A, Ulug AM, Crawford TO, et al. Quantitative proton MR spectroscopic imaging in acute disseminated encephalomyelitis. AJNR Am J Neuroradiol2001;22:1125–30. Honkaniemi J, Dastidar P, Kahara V, et al. Delayed MR imaging changes in acute disseminated encephalomyelitis. AJNR Am J Neuroradiol2001;22:1117–24. Hartung HP, Grossman RI. ADEM: distinct disease or part of MS spectrum? Neurology2001;56:1257–60. Singh S, Prabhakar S, Korah IP, et al. Acute disseminated encephalomyelitis and multiple sclerosis: magnetic resonance imaging differentiation. Australas Radiol2000;44:404–11. Barkhof F, Filippi M, Miller DH, et al. Comparison of MR imaging criteria at first presentation to predict conversion to clinically definite multiple sclerosis. Brain1997;120:2059–69. Hung KL, Liao HT, Tsai ML. Post-infectious encephalomyelitis: etiologic and diagnostic trends. J Child Neurol2000;15:666–70. Cuadrado MJ, Khamashta MA, Ballesteros A, et al. Can neurologic manifestations of Hughes (antiphospholipid) syndrome be distinguished from multiple sclerosis? Medicine2000;79:57–68. Dey KB, Trikha I, Banerjee M, et al. Acute disseminated encephalomyelitis—another cause of postmalaria cerebeller ataxia. J Assoc Physicians India2001;49:756–8. Mohsen AH, Mckendrick MW, Schmid ML, et al. Postmalaria neurological syndrome: a case of disseminated encephalomyelitis. J Neurol Neurosurg Psychiatry2000;68:388–90. Straub J, Chofflon M, Delavelle J. Early high-dose intravenous methyl prednisolone in acute disseminated encephalomyelitis: a successful recovery. Neurology1997;49:1145–7. Kanter DS, Horensky D, Sperling RA, et al. Plasmapheresis in fulminant acute disseminated encephalomyelitis. Neurology1995;45:824–7. Pradhan S, Gupta RP, Shashank S, et al. Intravenous immunoglobulin therapy in acute disseminated encephalomyelitis. J Neurol Sci1999;165:56–61. Sahlas DJ, Miller SP, Guerin M, et al. Treatment of acute disseminated encephalomyelitis with intravenous immunoglobulin. Neurology2000;54:1370–2. Marchioni E, Marinou-Aktipi K, Uggetti C, et al. Effectiveness of intravenous immunoglobulin treatment in adult patients with steroid resistant monophasic or recurrent acute disseminated encephalomyelitis. J Neurol2002;249:100–4. Keegan M, Pineda AA, McClelland RL, et al. Plasma exchange for severe attacks of CNS demyelination: predictors of response. Neurology2002;58:143–6. Cohen O, Steiner-Birmanns B, Biran I, et al. Recurrence of acute disseminated encephalomyelitis at the previously affected brain site. Arch Neurol2001;38:797–801. Belopitova L, Guergueltecheva PV, Bojinova V. Definite and suspected multiple sclerosis in children: long term follow-up and magnetic resonance imaging findings. J Child Neurol2001;16:317–24. Chou HVV, Hien TT, Sellar R, et al. “Can’t you use another vaccine”? Post-rabies vaccination encephalitis [letter]. J Neurol Neurosurg Psychiatry1999;67:555–6. Modi G, Mochan A, Modi M, et al. Demyelinating disorder of the central nervous system occurring in black South Africans. J Neurol Neurosurg Psychiatry2001;70:500–5.